Let me help you create the wedding of your dreams - with over 10 years of experience, SOUNDBAR Entertainment is your best choice for wedding DJ in the Poconos, Scranton, Lehigh Valley and beyond! Make your wedding one to remember. You've finally found the perfect partner. Now it's time to hire the perfect entertainment for your wedding. Let’s be honest - the thought of your typical wedding DJ is pretty awful. So I created SOUNDBAR Entertainment as an alternative to generic and forgettable DJs and to offer a more modern, personal and fun approach to DJ entertainment. In short, I create awesome events for awesome people like you. • I only perform one event per day, so my entire focus is solely on you. • I perform without resorting to any gimmicks, constant talking or cheesy routines. • You’re the stars of the show, not me. • I avoid a cookie-cutter approach as each wedding is unique and one-of-a-kind. • I look at my couples not as clients, but as friends that I treat like family. • What I do is important and I LOVE what I do. It’s a combination of talent, technology and experience that makes SOUNDBAR Entertainment stand out. My personalized approach to your wedding isn’t one where I just do the same thing over and over again. It’s a unique experience EVERY time that is custom-tailored to YOU. Your DJ is not just there to play music - they are going to act as quarterback your entire wedding. Almost every part of the reception involves an announcement or DJ in some form - the grand entrance, the first dance, the toasts, parent dances, dinner music, cake cutting, and most importantly, dance music. 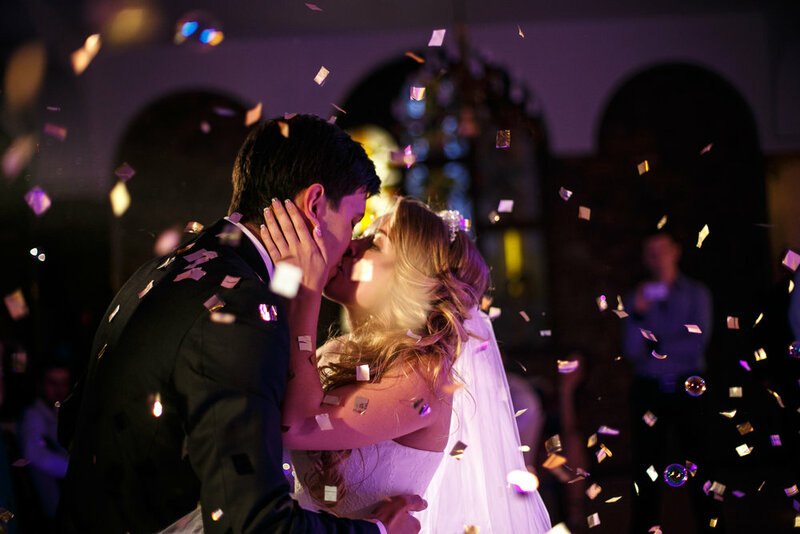 I will work with you on every detail to create the wedding you always dreamed about – a room full of the most important people in your life, packing the dance floor, having the time of their lives, creating lasting memories and leaving your guests shouting, "One more song!" Your wedding is a true production, and it should have its own soundtrack. Whether you have a list of must-play songs you want to hear or you have no idea where to start, I'll personally work with you set the perfect atmosphere. I have a wealth of knowledge in all music types and genres, so I can steer you in the right direction and can provide some suggestions for how to make the most out of your special day. Instead of just playing song after song randomly like a jukebox, I seamlessly mix your favorite songs and genres together and use my ability for reading the crowd to keep your guests dancing from the first song to the last. I've performed at countless weddings over the course of the past 10 years, so I understand how important this day is for you. You can rest assured that I will provide a professional, sophisticated and unique performance that your wedding truly deserves. For ceremonies, I’ll ensure all of your guests hear your ceremony music and your officiant clearly. For your reception, I’ll provide background music at a comfortable volume during dinner courses so your guests can mingle and carry a conversation. Announcements will be classy, polished and engaging, ensuring a smooth flow throughout the reception. The music you select will be played at the right time during each portion of the event. And when it’s time to dance, I'll use my unique mixing style and seamlessly blend your music preferences and playlists to create an experience all of your guests will enjoy. Working with a wedding planner? No problem! It’s very common for DJs and event planners to work together at special occasions. I’ll even be happy to recommend a great professional for you. Visit the Contact page to set up your appointment and discuss your wedding today! I GUARANTEE YOU WILL HAVE THE TIME OF YOUR LIFE. LET'S MAKE IT HAPPEN TOGETHER.